I spent a lot of time exploring around Door County today. One of the first things I wanted to do was check out Peninsula State Park over in Fish Creek. From there, it's just a quick jaunt down to Egg Harbor and the Alpine Resort where I spent many vacations as a child. We always stayed in the same cottage each year and always spent a lot of time in the main lodge. It was there that I once ran afoul of the owner, "Dollar" Bill Bertschinger when my seven-year-old self insisted on pushing the start button for him during one of his video bowling games. Aside from that scary incident, I always had a great time going to The Alpine Resort and was more than a little sad when we stopped going there in favor of another resort across the peninsula. Given how much Door County had changed in the last 30 years, I had thought that The Alpine was going to be a lot different as well. Aside from a pool attached to the lodge, nothing seems to have changed. 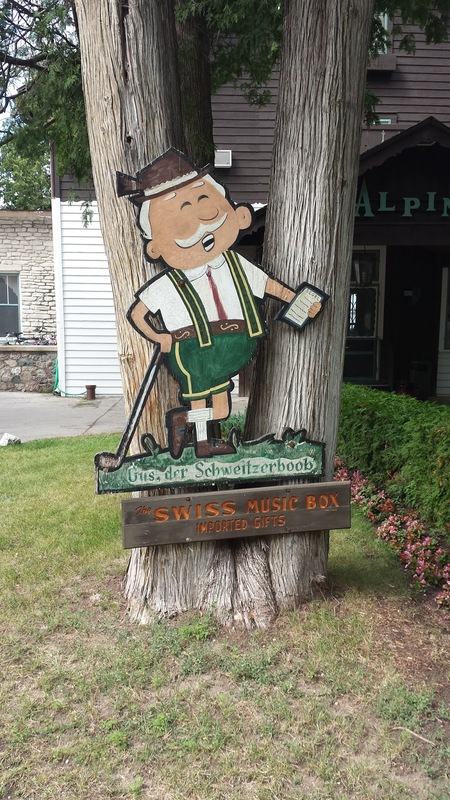 When I walked into the lodge, the lobby looked just like I had remembered it with its German inspired decor nestled beneath a canopy of cedars. The Hof Restaurant looked as if it was waiting for me, my siblings and my parents to come down for a meal. Even the old bar and game room were still there, both looking just as they did 30 years ago (except that there are new games in the game room). I half expected to see myself run through the door behind my brothers to play a few rounds of pool while "Cat Scratch Fever" played over and over again on the jukebox. I smiled to myself and shook my head in awe about how little the place had changed. One of the ladies behind the counter noticed and asked if I needed some help. I informed her about how I used to spend vacations at The Alpine as a child and it turned out that it was one of "Dollar" Bill's own daughters. I didn't have the heart to ask if the old guy was still alive, mainly because, if he wasn't, I didn't want to know. Of course, that meant that I couldn't apologize for the button pushing incident, but, my sense of nostalgia will let that one go. 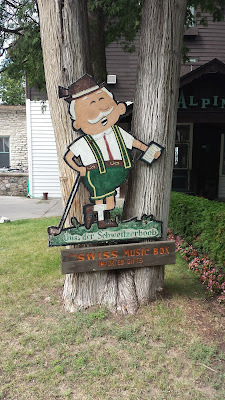 A keen eye will notice that Gus's placard refers to him as "Gus, der Schewitzerboob" which I take to mean "Gus The Swiss Dude". I could have sworn that, thirty years ago, that placard said "Gus Von Alpine". Also, even though my German is very rusty, I think that "Schweitzerbube" would have been the correct spelling rather than "Schweitzerboob". Maybe it's a slang form that I'm not familiar with, or maybe old "Dollar" Bill was trying to be a little cheeky.